How does Captain America’s shield remain virtually indestructible when subjected to the Hulk’s strength or Thor’s hammer? Now researchers from Arizona State University and the Army Research Laboratory have teamed up to push the limit of what’s possible with materials science outside the Marvel Universe. They’ve designed an alloy of copper and tantalum that can withstand extreme impact and temperature — bringing society one step closer to having real-life materials with superhero strength. 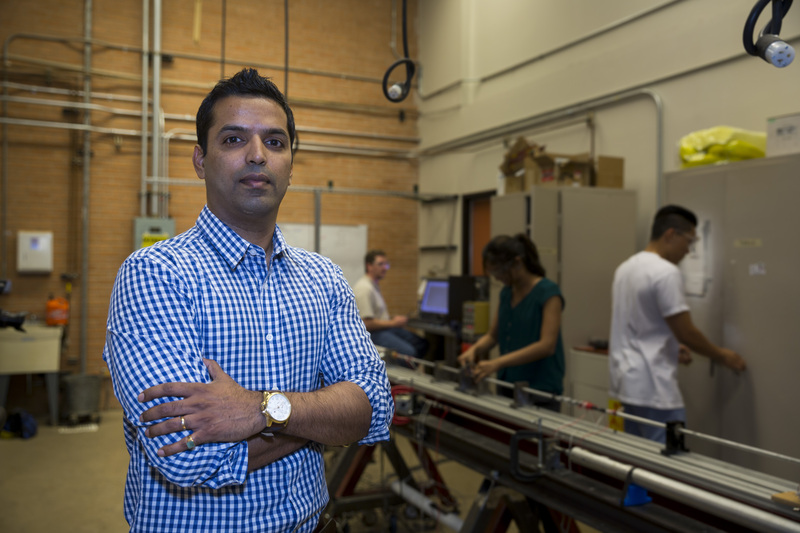 Kiran Solanki, an associate professor in the Ira A. Fulton Schools of Engineering, is working on the copper and tantalum alloy, which has the potential to be used in protective equipment for the armed forces and on spacecraft for deep-space exploration. The same methodology can also be applied to other materials, such as nickel or iron, to develop more resilient transportation and sustainable infrastructures. Most structural metals experience sudden deformation when subjected to extreme impact and temperature, such as the force from an automobile accident or the impact that occurs during a ballistic event. When a typical metal deforms at a fast rate, it loses its ability to deform in a ductile way and becomes brittle, absorbing relatively little energy prior to fracture or failure. This instability has motivated the multidisciplinary research team to improve the toughness of coarse-grained metals and alloys to prevent metal deformation and failure. They created a nanocrystalline alloy of copper and tantalum with engineering-enhanced properties to make it maintain a relatively consistent level of mechanical strength and microstructure stability. “The technical challenge was to make a material with an average grain size of about 50 nanometers (billionths of a meter) and remain stable when formed into usable parts or shapes,” said Solanki, a co-author on the paper. The unusual combination of properties in the copper-tantalum alloy results from a processing route that creates distinct nanoclusters of tantalum. As temperature increases, these nanoclusters don’t significantly change in size or spacing, which leads to the material’s notable stability and strength. The alloy can withstand high rates of impact and temperatures in excess of 80 percent of their melting point, which can reach as high as 1,073 kelvins (about 1,472 degrees Fahrenheit), with very little change in its microstructure. The high strength and good electrical conductivity of this material make it ideal for use in ballistic protection applications for armed forces, such as in armored vehicles, combat gear and other equipment for service members, where the material’s physical attributes could help save lives. These mechanical properties have never been observed before in literature on coarse-grained or nanocrystalline materials. “Our team is bringing materials closer to the theoretical limit and extending beyond what’s perceived as possible,” Solanki said. Solanki credits the Fulton Schools for enabling the team’s innovative development. He was able to recruit doctoral students from two disciplines to pave the path toward this discovery. Additionally, the collaboration with the Army Research Laboratory has made the project a success as the team develops an alloy that is more resilient than most other structural materials. According to Darling, the Army Research Lab has had a robust program in designing thermally stable bulk nanostructured metals for the past six years or more. However, the lab’s capability to produce bulk samples in large qualities has led to the ability to perform additional characterization that many other universities and labs have not been able to do. The copper-tantalum alloy was originally developed to replace copper-beryllium, a high-performance alloy known for its strength, conductivity, hardness and corrosion resistance. Copper-beryllium is critical for a range of applications, but the handling, manufacturing and machining of beryllium can cause a serious lung condition called chronic beryllium disease. Thus, the International Agency for Research on Cancer and the National Toxicology Program have designated the alloy as a carcinogen. The team continues to work toward replacing copper-beryllium with an equally superior metal alloy with similarities in its mechanical properties of strength, conductivity, hardness and corrosion resistance. The copper-tantalum alloy is a step in that direction. Through the teams’ combined efforts, society may soon have access to materials with superhero strength without compromising the well-being and health of the people manufacturing them.